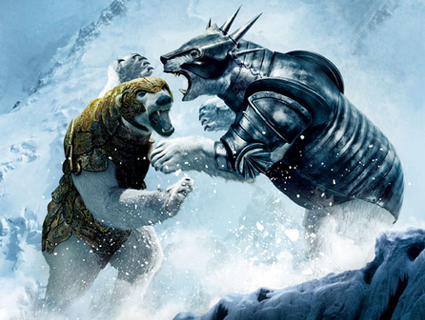 Panzerborn is a race of intelligent arctic bears whose main habitat is Dragonia, where most of them are in the service of Queen Innia of Dragonia. The Panzerborn society is a lawful neutral mercenary society of ferocious, yet truthful, physically intimidating bears. Bear hug: If you roll a natural 20 on any claw attack, you do not critically hit, but get a free bear hug for 3d8+str bonus instead. Panzerborn can walk on two feet, but prefer to move around on all four. If they walk on two feet, their movement is halved.